DC Alumni Club members are dedicated to supporting YOU, our future leaders! Our chapter provides scholarships, mentoring, career networking, emergency support, and leads for internships. This page provides information on theses services. Read our monthly e-newsletter for scholarship and intern opportunities from various businesses and organizations. We welcome you to attend our events and monthly meetings held on the fourth Monday at 7:00PM on campus. View the events page for details. Join our mailing list and follow @HUACGWDC on social media for up to date information! 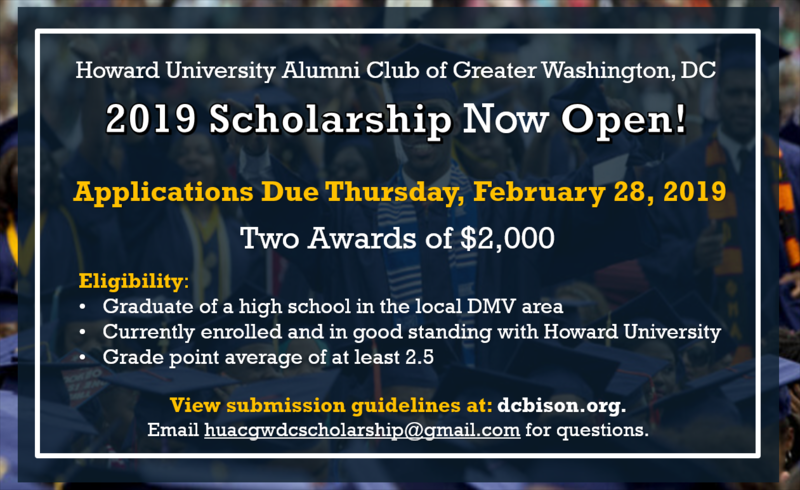 HUAC GWDC 2019 Scholarship Application Opens January 28! Calling all Howard University students! HUAC GWDC will award scholarships in the amount of $2,000 each, to two undergraduate students currently enrolled in a degree-seeking curriculum and who are in good standing at Howard University. Applicants must email a complete application package to huacgwdcscholarship@gmail.com, no later than Thursday, February 28, 2019, 11:59 PM. The Thurgood Marshall College Fund (TMCF) offers a variety of programs, networking, and recruitment opportunities, conferences and professional development for students. TMCF offers four types of unique merit and need-based scholarships to address the financial needs of students attending TMCF-member schools. The awards process is highly competitive, and the awards are given to outstanding and qualified students who plan to earn a baccalaureate, graduate or law degree from an accredited college or university. Occasionally, TMCF may offer scholarships to students not attending one of the member schools. Most scholarships are one year, non-renewable and the average award is $3,100. Howard University is a member school and students are eligible to apply. Learn more about the TMCF at: https://www.tmcf.org/. Forgiveness, cancellation, or discharge of your loan means that you are no longer required to repay some or all of your loan. What is the difference? Forgiveness or cancellation is when you are no longer required to make payments on you loans due to your job. A discharge is when you are no longer required to make payments on your loans due to other circumstances, such as total and permanent disability or the closure of the school where you received your loans. Learn more information about loan forgiveness on the U.S. Department of Education’s website at: https://studentaid.ed.gov/sa/repay-loans/forgiveness-cancellation?src=ft#differences. Each March, our chapter hosts a networking seminar, “Backpacks to Briefcases.” Students interact with alumni, representing various career fields, and receive tips on resume writing and interviewing skills. The seminar is free and open to all Howard University students.